In this edition of 'Czechs in History,' Brian Kenety takes a look at the life of Czechoslovakia's greatest race car driver, Eliska Junkova, the "queen of the steering wheel" and Jazz Age belle, whose stellar career came to a screeching halt after a tragic accident claimed the love of her life. Born in 1900, at the dawn of a new century and on the cusp of the commercial age of the automobile, Alzbeta Junkova would grow up to become arguably the greatest female driver in motor racing history, and the most famous Czech driver to tackle the Grand Prix circuit of Europe. Eliska, as she liked to be called, was born in the Moravian town of Olomouc, in a sleepy corner of the Austro-Hungarian Empire, the daughter of a blacksmith and the sixth of eight children, though only four lived to reach adulthood. From an early age, the slight girl nicknamed "smisek" for her ever-present smile dreamt of traveling the world. She loved to study foreign languages and by the age of 16, spoke fluent German and passable English, skills which helped her land a job in the Olomouc branch of a mortgage bank after high school. It was in the Olomouc bank that she met Vincenc "Cenek" Junek, an ambitious young man who had been discharged from the army after being shot in the hand and was then charged with getting the branch up and running. Eliska Junkova Both headstrong, they initially gave each other a wide berth. But when Cenek moved to Brno to open yet another branch of the bank, he took his employee Eliska along. In Brno, Eliska began formally studying foreign languages. Over the next six months, romance also began to blossom and Eliska and again followed Cenek when he was reassigned to Prague. There she sat for the state exams in English and began studying French. She decided to immerse herself in the language, and went to France to work in a garden nursery, putting off Cenek's offers of marriage. Eliska also dreamt of world travel. Her plan was to see the deserts of North Africa and then head for Ceylon, today known as Sri Lanka. She made her way towards Gibraltar; when Spanish customs officers wouldn't let her embark for the Mahgreb, she joined the kitchen staff of a British ship heading that way, but was denied a visa in London, and so returned to France. Cenek came to meet his beloved Eliska in Paris - but not under the Eiffel Tower or on the romantic banks of the River Seine. After a long separation, they met in an auto salon. Cenek had done well for himself during the early years of the Czechoslovak First Republic and by 1921 he was sufficiently wealthy to indulge his passion for fast cars. Eliska Junkova later recalled thinking: "If he is going to be the love of my life, then I better learn to love these damned engines." But before long she too became smitten with the beauty of the racing cars on show, especially the Italian-designed, French-made Bugattis. On returning to Prague, she took driving courses in secret and got her driver's license. Meanwhile, Cenek' had started racing in earnest. In 1922, he won the Zbraslav-Jiloviste race, now Europe's oldest uphill course and finally married his Eliska. Before long, the Juneks began competing in local racing events as a husband-and-wife team; because of his wartime injury, Cenek had trouble shifting gears and so Eliska, then the riding mechanic, took over. They bought a state-of-the-art Mercedes and in the autumn of 1922, an Italian-made Bugatti Type 30, a cigar-shaped racer which Cenek gave his wife after a tough win in 1923. It would become Eliska's trademark. Ettore Bugatti grew up in a household of artists, surrounded by poets, painters, sculptors and architects. He took this rich artistic heritage and melded it with his love for the automobile to create a legendary marque. At its peak, the Bugatti not only produced the most luxurious, sought-after — and expensive — cars on earth, but also a series of racers that defeated all comers. According to the book "The Amazing Bugattis," in April 1924 Ettore wrote to his friend and faithful customer Cenek in Prague, sending him the sketch of what the 1924 car was to look like. "Springs and so on are completely within the body works," he wrote. "The under part of the car is completely straight, only the cooling ribs project through. The front axle is a mechanical masterpiece. It is a hollow axle of quite new construction." Bugatti later explained that he had abandoned the thick aerofoil body used on the tank cars "in spite of its technical advantages, simply with the object of obtaining a more elegant shape, to facilitate sales." The Bugatti race cars were some of the most beautiful cars ever built but suffered from inadequate brakes. 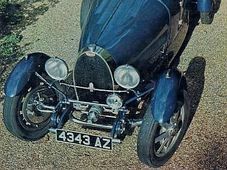 After being criticized over the design of his brakes, Ettore Bugatti reportedly quipped: "I build my cars to go, not stop." The flamboyant Italian also became a lifelong friend to Eliska — and mourned with her when she lost her husband. Eliska's first professional race was in 1923, at Cenek's side. 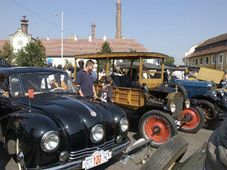 The following year took the wheel herself and at Lachotin-Tremosna, in Czechoslovakia, won in the category of touring cars. Overnight, she became a national celebrity. Eliska placed first in 1925 at Zbraslav-Jiloviste. The Juneks bought a second Bugatti to celebrate but also because that year riding mechanics were banned on the big-name European circuits, as they had been in America, and the couple had to race separately. By 1926, Eliska Junkova was good enough to compete in races throughout Europe against the best male divers of the age. "What a beautiful sporting couple; Junek and his wife. His dedicated and excited pupil, in whose slim body is beating the heart of a brave man and whose childlike hands drive her car with unmistakable security and at great speed through tight curves." Also in 1926, Eliska took second place at Klaussenpass in Switzerland and was a remarkable success at the Targa Florio in Sicily, an exceptionally demanding course. She spent a month in Sicily before the event, carefully noting the 1500 corners of the 67-mile-long course. The men mocked her because the Targa was a race that required extraordinary stamina. But Eliska was a gifted technical driver who used her memory more than her physical strength. 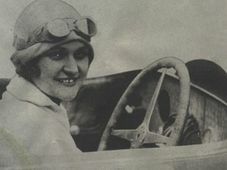 She is often credited for being one of the first drivers to walk round a course before an event, noting landmarks and checking out the best line through the corners. Her preparation paid off: At Targa Florio, she was in fourth place until her steering failed and she crashed into a ditch along the rough and muddy course, only narrowly escaping a fall of a cliff. Shortly after that close shave, she won in the two-liter sports car class at Nurburging, Germany, making her the first woman in history ever to have won a Grand Prix race. A tiny woman, a congratulatory embrace by the husky, overall winner of the event, the German Otto Merz, left her with two broken ribs. As her fame spread throughout Europe, Eliska anglicized her name to Elizabeth Junek. The racing press dubbed her the "Queen of the steering wheel." With her sights on the 1928 Targa Florio, she bought a new Bugatti Type 35B, but finished fifth. In July that year at the Grand Prix in Germany, she was sharing the driving with her husband. She had just changed places with Cenek when he veered off course — and was killed instantly. Absolutely devastated, Eliska sold off their cars and gave up racing. She never competed at the Brno Grand Prix, the longest circuit used in Grand Prix racing in the 30's, and the pride of the new Czechoslovak nation. Instead, Eliska retuned to travel, her first love before Cenek and racing. She set out for Ceylon and Etton Bugatti himself gave Eliska a flashy new touring car for the journey, and hired her to seek out export opportunities to the sub continent. Eliska did find love again and remarried shortly after the Second World War. But from 1948 to 1964, the Communist authorities — disapproving of the high-flying, bourgeois lifestyle that "Elizabeth Junek" had lived — refused to allow her to travel abroad. "I proved that a woman can work her way up to the same level as the best of men. We women sometimes tend to blame our failures on nature. It is far more productive to be less angry and more hardworking. Some handicaps can easily be overcome." Eliska Junkova died peacefully in January, 1994, but her spirit lives in Czech composer Jaroslav Jezek's 1928 jazz classic, "Bugatti Step."